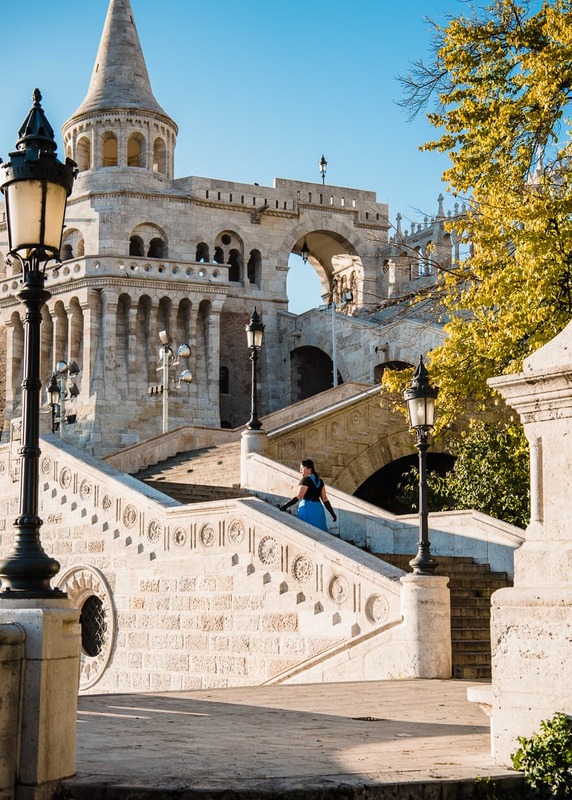 The Fisherman’s Bastion is one of the top destinations in Budapest, Hungary – and with good reason. 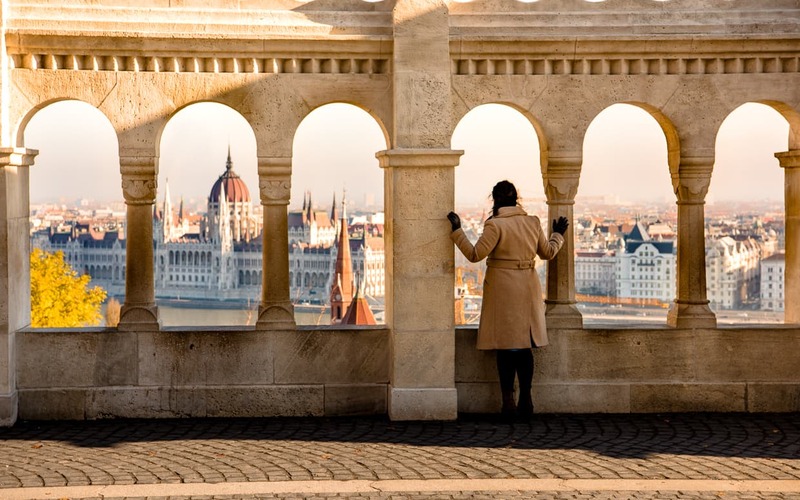 Not only is the structure itself stunning – with it’s white towers and staircases that bring to mind an elaborate sandcastle – it is also adjacent to the towering Matthias Church, and gives you a great vantage point for the Danube and the Hungarian Parliament Building. Indeed, we returned home with some pretty good photos. But we’ll never know how much better they could have been, or how much more we could have enjoyed ourselves if we had followed our own rules we’d established over months of full time travel and photography. A week before our photo shoot, we were right on track. We actually took a hop-on-hop-off bus tour, which is rare for us, and we used it as an opportunity to do our location scouting. 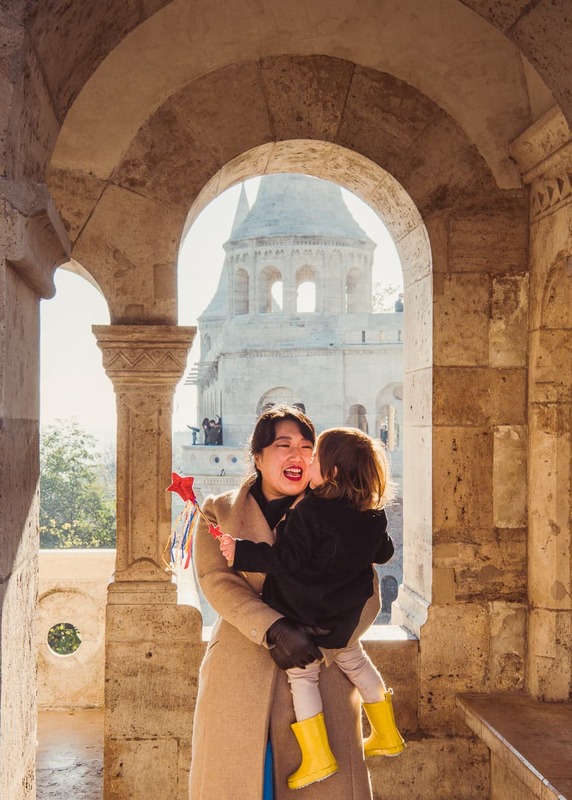 We walked around the Fisherman’s Bastion (Google Maps) and planned out our angles and decided what outfits would look good for Lisa and me. I really loved the balconies that overlooked the stairs on Castle Hill. Jake was excited about the views of the Parliament Building through the columns and archways. Lisa mostly wanted to climb on the fountain. 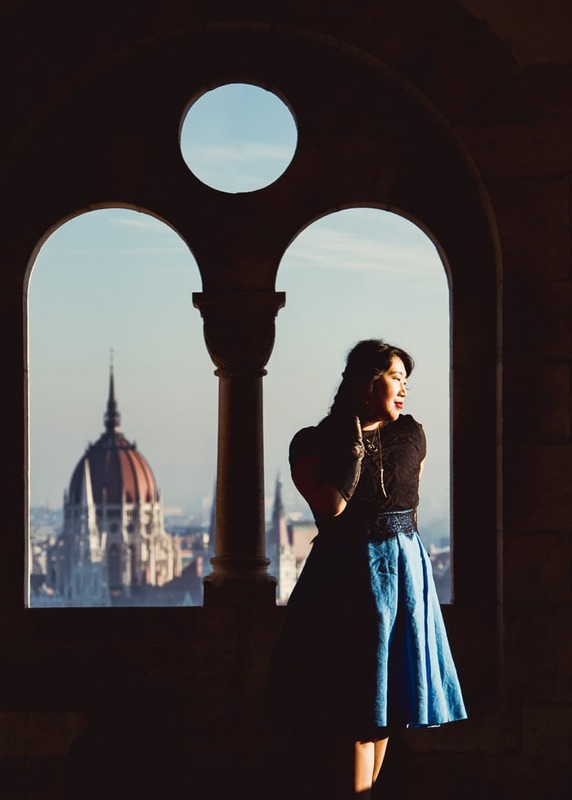 We decided that I would wear my favorite blue dress that looks like it belongs in a castle (it fit right in at Versailles, France and at the Diocletian’s Palace in Split, Croatia) along with a pair of long black opera gloves we bought back in Prague in September. 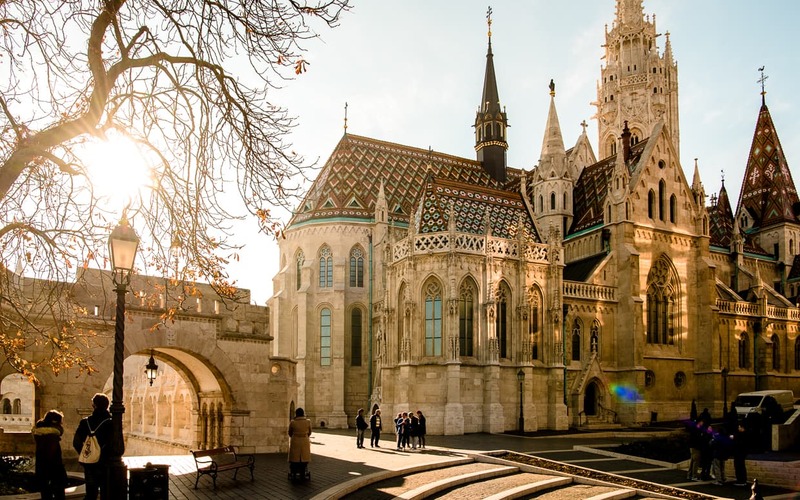 The Matthias Church in Budapest, Hungary. But when it came time to actually go out and do the photo shoot, we made a number of mistakes that took the joy out of our favorite activity. You know you screwed something up when you are happier to see a Starbucks than the scenery. The first mistake we made was our transportation. 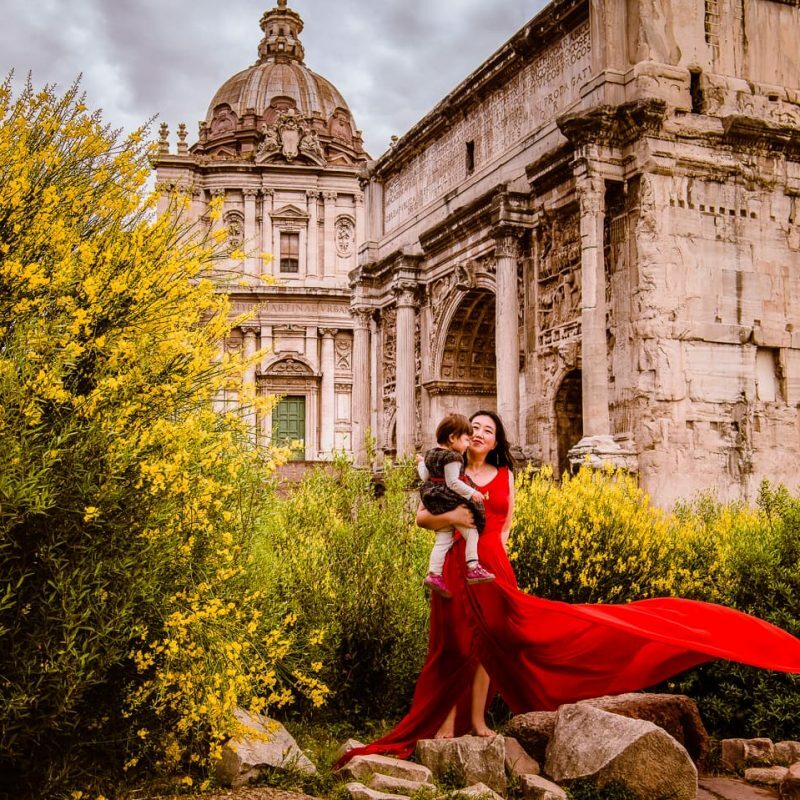 Usually, we stay as close as possible to the sites we think are most desirable so we can photograph them at our leisure (like when we stayed next to the colosseum in Rome, Italy). In Budapest, we were a little farther from the action because 1) we waited a little too long to book, and 2) we wanted to save a little extra money. Our favorite mode of transportation in a foreign city is Uber. 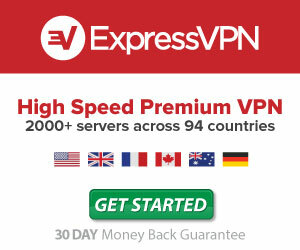 Yes, they have developed a bad corporate reputation, but the service is phenomenal – fast, convenient and affordable. Unfortunately, Budapest made the decision to ban Uber, so we had to search for an alternative. This shouldn’t have been a problem since the public transportation in Budapest is actually pretty good. There are buses, trollies, street cars and a metro. But because the route from our Airbnb was indirect, paying for a ride would only save us a few minutes compared to going on foot (35 vs 45 minutes). So we walked. What we failed to take into account was that catching a ride has other benefits besides walking. As it happened, the morning we chose was the first day of the year that the temperature dropped below freezing. We wore our coats and we covered Lisa in blankets. 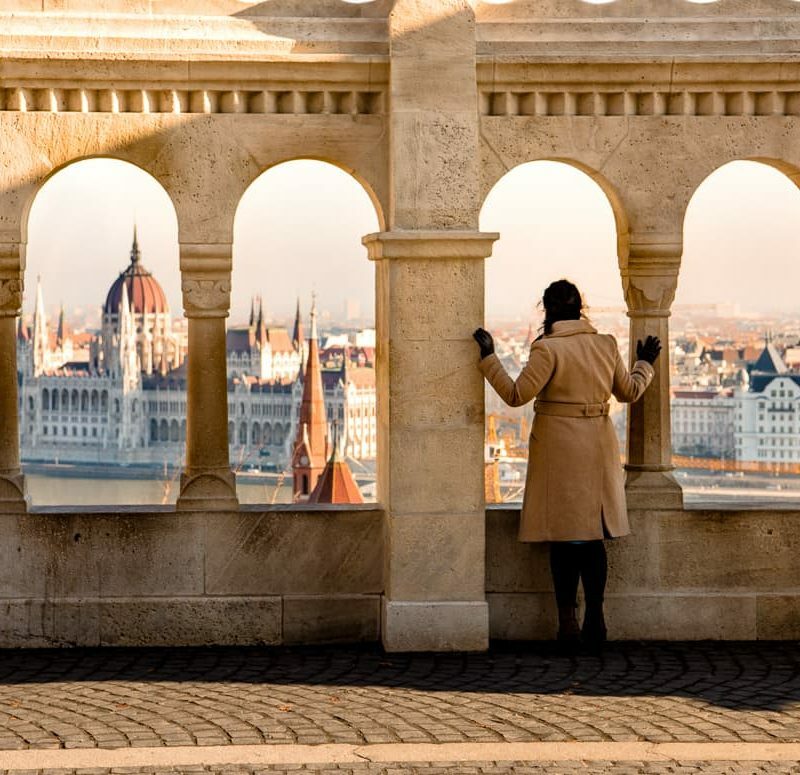 But as our stroller’s wheels crunched through the winters first ice on the sidewalk puddles, the wind began to blow over the Danube, and we started to feel the chill. 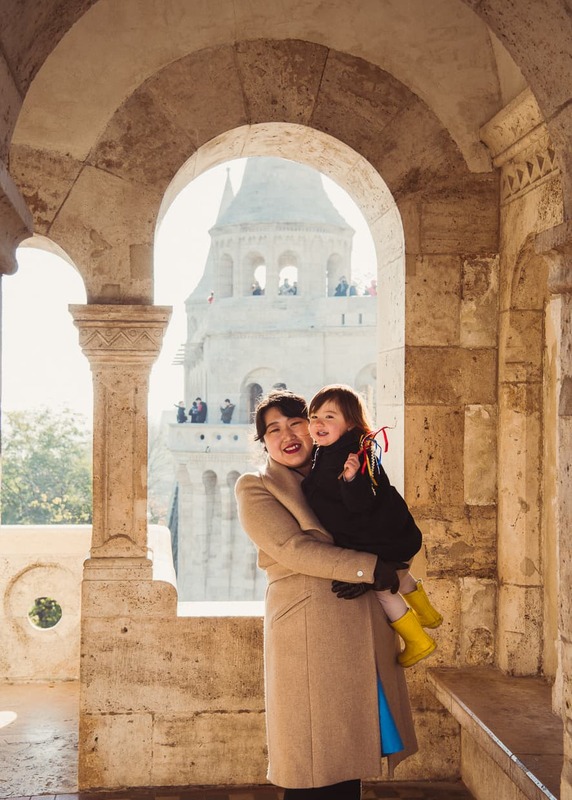 By the time we got to the Fisherman’s Bastion, Lisa was crying and Jake’s hands were numb as he fumbled with the camera bag. Taxis are expensive in Budapest. Their fare system is complicated, and we found them difficult to flag down. 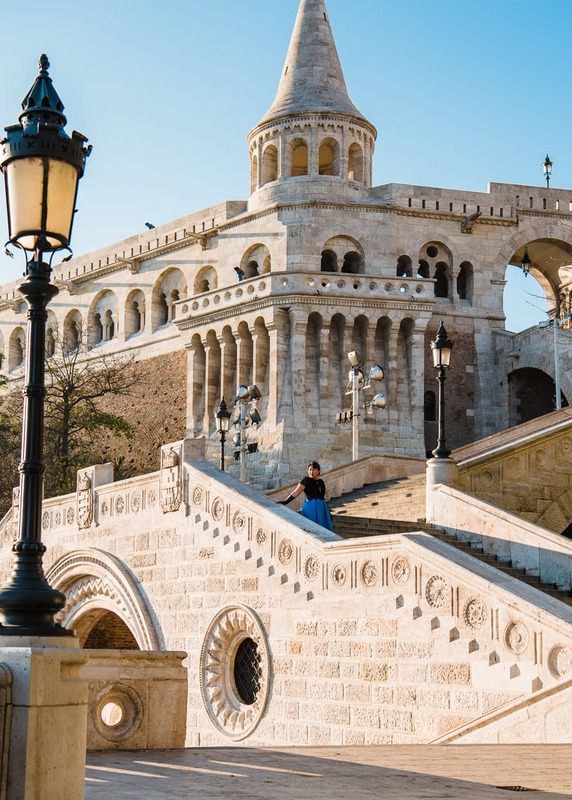 Regardless, we should have called one the night before to take us to the Fisherman’s Bastion at dawn. Luckily, by the time the tourists showed up and the shoot was over, it had started to warm up and we had no problem walking home. I don’t remember what we ate for breakfast that morning, but it was rushed and it wasn’t enough. Lisa didn’t refused to eat at the table (she was going through a phase) and we opted to give her snacks for the stroller ride. Unfortunately she was so upset about the cold that she wouldn’t take her mittens off, and she couldn’t handle her food with them on. Hunger definitely contributed to Lisa’s crying once we were in the field. She wasn’t able to participate in the first half of our photo shoot, which was probably the most disappointing part of the day because she’s usually a superstar. I don’t know how we would have gotten food in her if we could turn back time, but I know we would have tried harder. 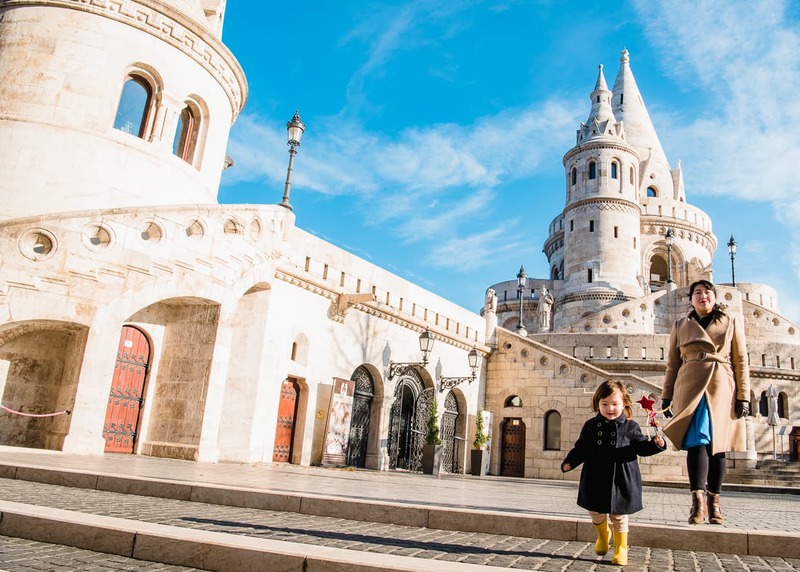 Jake, Lisa and I spent a month in Budapest, and though we did our scouting nice and early, we waited longer than we had to to photograph the Fisherman’s Bastion. Not only did the temperature continue to drop as winter approached, we also left ourselves with fewer options. On our fist trip to Paris, we made several visits to the same location until we were happy with the Eiffel Tower photos we got. In Budapest, did our photoshoot with just over one week left. This should have been enough for a redo, except that it turns out November in Budapest is very rainy. There was no way Jake was dragging us up to the top of that hill in the rain for another shoot, this time in rain gear with mediocre lighting. Looking at the ten day forecast and seeing that row of cartoon rainclouds was pretty disappointing. Bad weather is a downside of off season travel that we have to live with since we travel year-round. 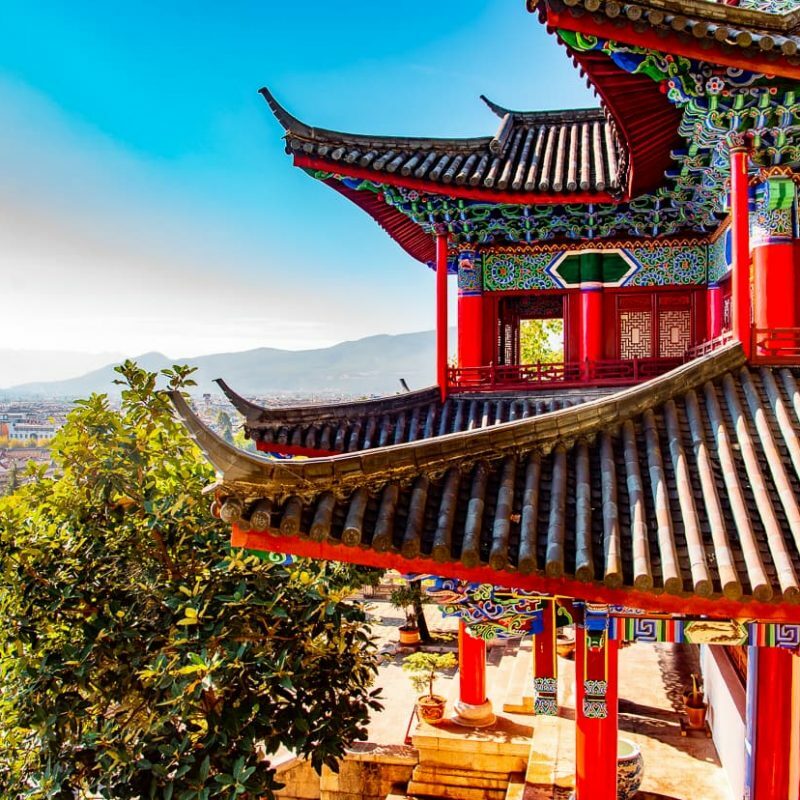 We don’t get to see every city at its very best, but at least there are special travel experiences in the mix that we would otherwise miss. Lisa wasn’t in the mood for photos when we first arrived at the Fisherman’s Bastion. 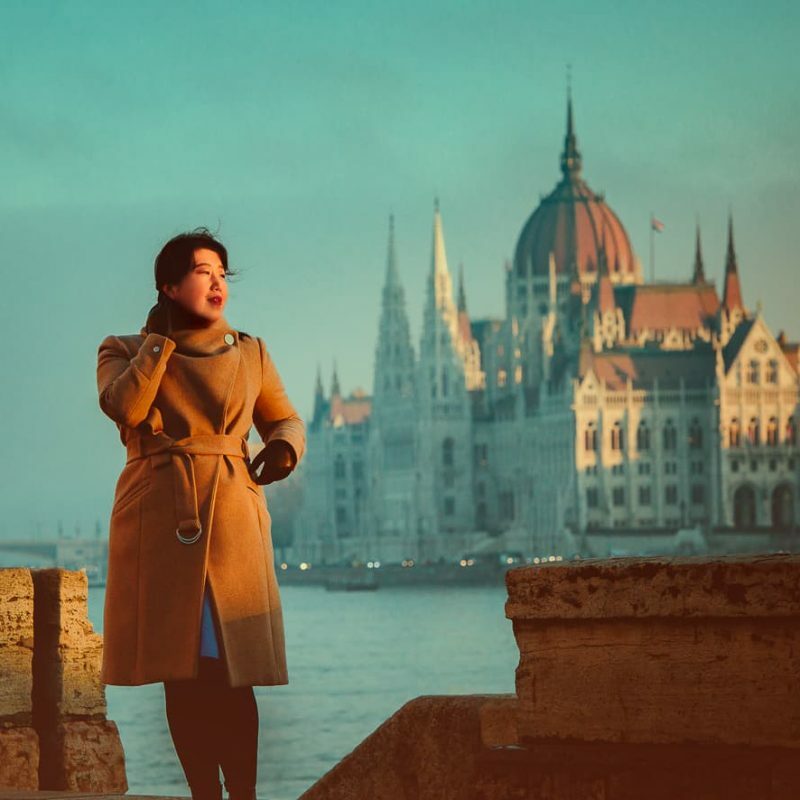 She’d been marched halfway across Budapest, and she was cold and hungry. She sat in the stroller and sulked next to Jake while he took my photos instead. If we’d made Lisa participate, she would have been miserable. Her teary eyes wouldn’t have looked good in the photos and she would have stressed me out (more so) by fighting against everything we did. She probably didn’t enjoy sitting in the stroller, but she calmed down. 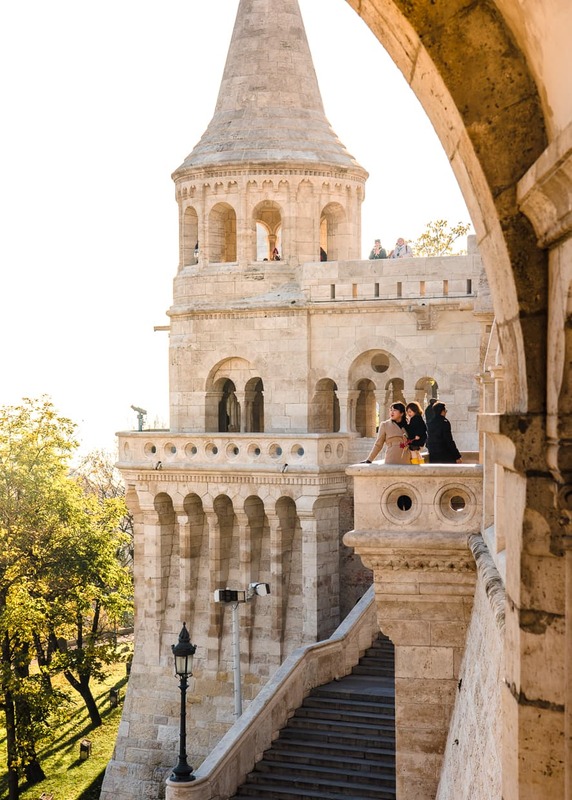 The Fisherman’s Bastion did have some great views. By the way, for that photo above with me in front of the window, Jake used a technique called exposing for the highlights. 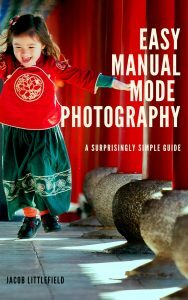 If you like the look of it but don’t know how it works, Jake describes the process in his e-book, Easy Manual Mode Photography, which is available in our shop. Jake probably already knew, but after a few minutes of taking photos in my blue dress, I made sure he was aware that it was time to put the layers back on. Jake has a personal policy when we go out for photo shoots. When it’s cold, he always wears less than Lisa and me. When it’s hot, he always wears more. He does that because he doesn’t want to be sitting standing there feeling comfortable and forget that Lisa and I might not be. Even so, there was no way he could wear less than the dress I had on, so I made sure to tell him when I needed a break. We both also communicated with Lisa. She didn’t understand everything we said back then, but she could intuit from the way we were talking what we wanted her to know. “This will be over soon, and we will make sure we do something nice for you.” She got herself under control, and even though we decided not to take off her jacket, she let us know that she was ready to walk around a bit too. 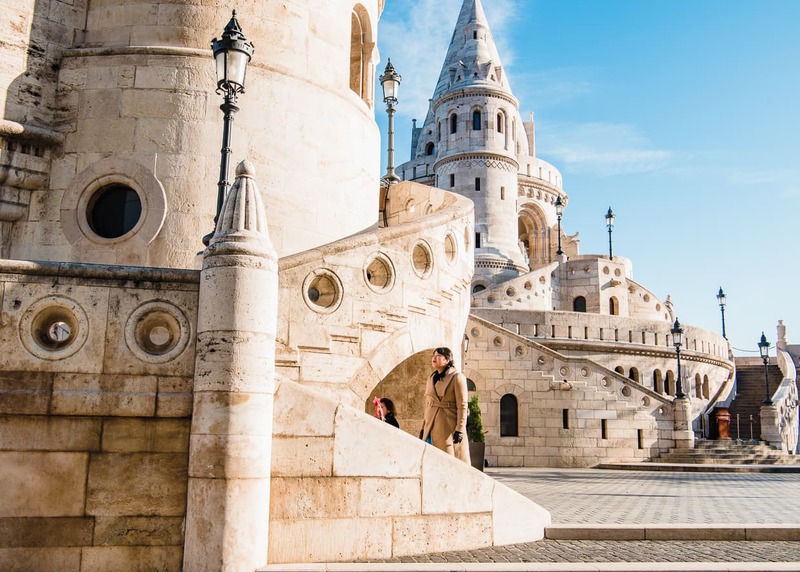 If you do decide to do an early morning photo shoot at the Fisherman’s Bastion in Budapest, it’s worth noting that it is right next to the Hilton, and in the bottom of the Hilton, there is a Starbucks that opens very early. I know, I know, you didn’t travel all the way to Hungary to drink at Starbucks, but if you are freezing your but off and hungry, you probably won’t be feeling very picky. After a few minutes of photography, I put my coat back on and the whole family marched right into the Starbucks. We ordered a giant coffee, a chai tea latte, a warm milk, and three triple chocolate muffins. After that, everyone felt a lot better, and Lisa was eager to be the star again. It was starting to get busy outside, but the light was still decent so we decided to take a few more photos before heading home. We never wound up taking our coats off again that morning, but Lisa’s favorite part of her outfit – the magic wand – did make an appearance. Even though the outing was discouraging in a lot of ways, I was really glad to see that we could recover a little and enjoy ourselves, even when we got off on the wrong foot. If you’d like to read about more of our travels, and see some photos from outings that actually went really well, head over to our destinations page to see where we’ve been in over a year of slow travel. 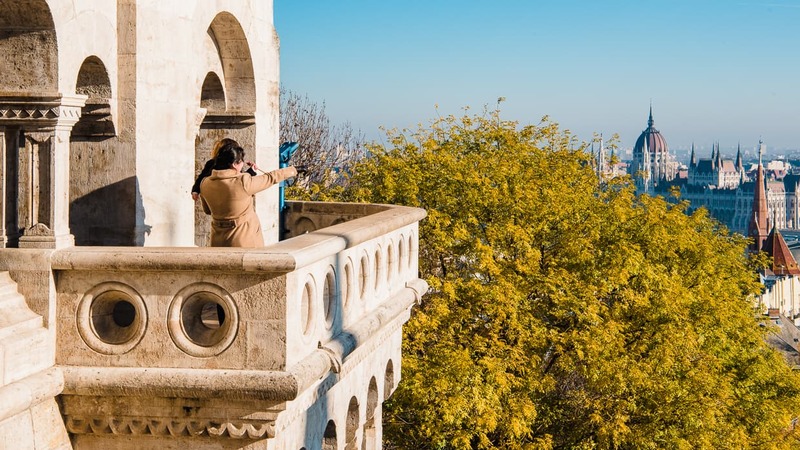 We’ll have more Budapest posts coming out in the next few weeks, if you want to hear more about what we did there for a whole month last November, either check back regularly, or sign up for our newsletter. Mistakes aside, it’s hard to take a bad photo of Budapest. Great story! Ginny and I send love. Excellent photo framing! Thank you, Ted! I hope you are both well!